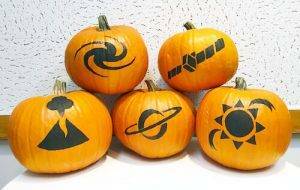 Which type of pumpkin do you prefer? A classic grinning gourd? A super-scary face with dry ice smoking out? A clever jack-o-lantern twist that makes you smile? What is the best pumpkin you’ve ever carved? Submit a comment to this blog by Halloween Eve, October 30, and let us know. 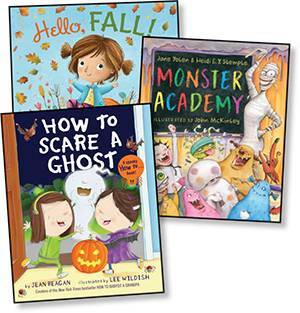 One lucky teacher will be randomly selected to win a real treat: a set of three books perfect for the season. Hello, Fall! (Farrar Straus Giroux)—Celebrate the wonders of fall, from woolly caterpillars to leaf piles ready for kids to jump in. Monster Academy (Blue Sky Press)—Visit a school that’s unlike any other. How to Scare a Ghost (Knopf)—Did you know ghosts can’t resist bobbing for apples? This cute book is filled with kid-friendly ghost-scaring tips. Check out these not-at-all spooky treats too. 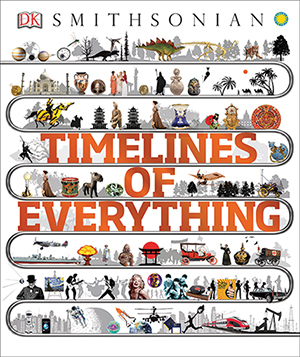 With more than 140 timelines, Timelines of Everything takes kids on a whirlwind visual exploration of, well, everything! Ten lucky teachers will win the book. Enter here. Are you working on your school’s yearbook? 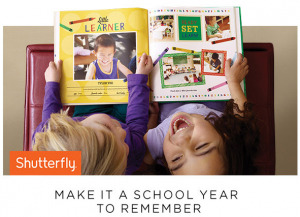 Check out yearbook options with Shutterfly. You’ll find easy-to-use tools, lots of choices, and speedy delivery for books that are made to last. Click here to learn more. Looking for a simple, educational slant on pumpkins? Check out the free, space-themed printable templates at NASA Space Place. Click here. The best pumpkin I’ve ever made looked like a hot air balloon. It took some engineering, but it was worth it! PS: This is Digital Citizenship Week. Check out these free resources from CyberWise and NetSmartz. I like the triangle eyes and large toothy smile. I like coming up with something unique each Halloween! Clever, funny ones are the best! I always am a sucker for a smiling pumpkin ???? My favorites are the story book characters – Pete the Cat, No, David, Captain Underpants and Diary of a Wimpy Kid have all been super fun to make with my students. I love a regular sppoky, grinning jack-o’-lantern!! I like the classic, grinning jack-o-lantern. But, like Nicole mentioned, making pumpkins into storybook characters is fun, too! Classic, silly grinning jack-o-lantern with a triangle eyes and nose. It also has to have funny teeth! I love any kind of jack-o-lantern or decorated pumpkin … seeing a variety of them always makes me happy. The best one I ever made was for school – we made our pumpkin into Mercy Watson (the pig) and it turned out great! I love pumpkin carving! One of my favorites was a witche’s face! I’m not so good at pumpkin craving but I know someone who’s able to make some wonderful cravings. My style is classic. The best one I ever carved was a witch on a broomstick. I like the white ones!! So pretty! My favorite is a classic jack-o-lantern, one that I have drawn the face on with marker and then cut out. I say I am going to do something different…but always seem to have a happy pumpkin. My pumpkins always look pretty classic…a regular jack-o-lantern. The best pumpkins I’ve ever carved are the ones my kids ask me to carve! I love seeing their excitement once it’s completed! ???????? My favorite kind of carved pumpkin is ANY pumpkin because I love fall and pumpkin season! I love the spooky carved pumpkins! Something odd or one of a kind is always my favorite. I love the classic jack o lantern, grinning for all to see. I prefer the classics – a flying bat, a uniquely designed jack-o-lantern. We always have a take home activity to help disguise a pumpkin so he/she won’t get eaten! Some of my favorites have been: Batman, Pete the Cat, Fancy Nancy, SpongeBob and Llama Llama! What fun titles and good information! My class and I always make a classic smiling jack-o-lantern, but at home I like to be creative. One year I made a little pumpkin town with two houses and a storefront. The best is the jack-o-lantern made from the really ugly scared pumpkin. One year with the after school kids, we put holes in our pumpkin with a nail and hammer and then stuck ghost suckers in it. On Halloween they each got to take a sucker home. I love the traditional pumpkin – reminds me of my youth and the fun I had trick-or-treating. However, I’m always impressed with the artistic ability some jack-o-lantern creators have!! My children and I prefer the traditional toothy grins, but my school children love when we make pumpkins decorated as their favorite book character. The traditional and simple decorative style. We like to change the design of our pumpkins each year. Each family member searches for a design and then we carve them a few nights before Halloween so that we can enjoy them a little longer! Halloween is my second favorite holiday after Christmas of course. I love carving pumpkins into jack-o’lanterns, sometimes ordinary faces for my first graders but scarier faces for my husband’s class and of course, something in between for the office at school. What is more welcome than a smiling jack to greet visitors. I love greeting trick-or-treaters with a porch full of shining jack-o-lanterns. We grow our own pumpkins just so I can carve lots of them. Love the look of the ones using stencils. Amazing how great they look and they are easy to carve. Every year my kdg. group has a pumpkin decorating contest. My favorite was a pumpkin made into a Cinderella coach with all the trimmings-pulled by horses, a Cinderella figurine and mice with a big clock (midnight) on the back of the box. It was so cute! I pick something different every year, last year I did the Nightmare Before Christmas face. It’s too early to carve pumpkins in South Carolina so I haven’t come with this years carving yet. I might do a minion.